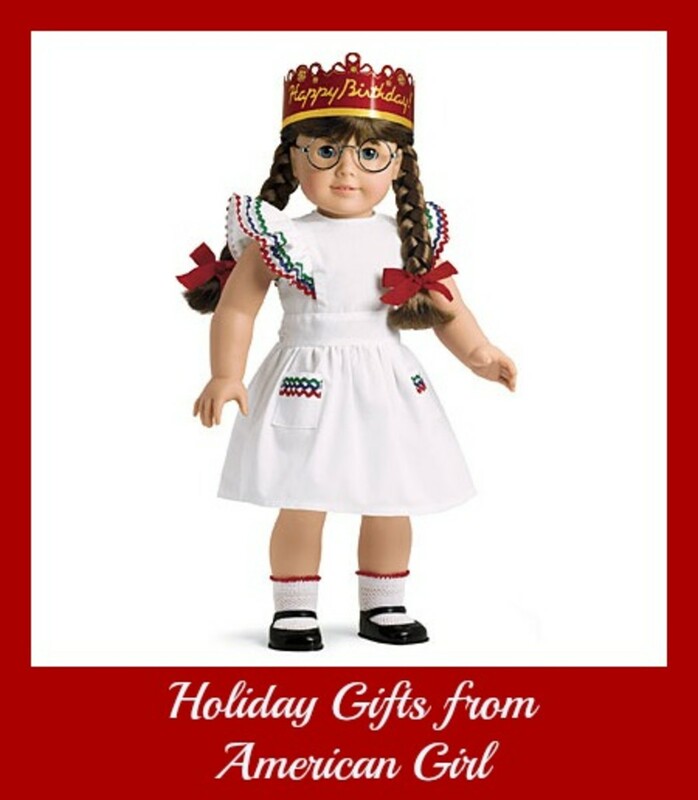 Time to share our American Girl Holiday gift picks. We&apos;re deeply into American Girl. Our family is hooked on the dolls, the movies, the accessories and well the whole lifestyle. They English major in me rationalizes that I&apos;m sharing a love of books and history with these dolls. The fashion maven in my believes that the relative innocences and timelessness of these dolls will help the girls from growing up too fast. Can you tell I&apos;ve got to justify our love? Here&apos;s why: I just placed a Christmas order that nearly topped $500. Yes, AG isn&apos;t for those who are going to dabble or who don&apos;t truly believe in the value of these dolls. But believe we do. We think the stories are rich and the dolls are "friends" not just playthings. In our world one special doll can replace a load of Barbies. So we carry on with our love of these girls. This year we&apos;ll be adding a new member to the family. If all goes according to plan. Santa will be bringing Molly to us. Yes, a very big year. Now it&apos;s my chance to get you hooked on more American Girl goodies. I&apos;m sharing my top 7 picks. Celebrate the season in this taffeta dress! Made to match the doll-sized version, it has a wide neckline, tucks above the waist, and a full skirt trimmed with a velveteen bow. Plus, the tulle lining is emerald green for a fanciful look! Sizes 6&apos;??16. Purple Party Outfit + Charm for Dolls($36) Dress your favorite doll in this matching taffeta party dress featuring black piping details, tucks above the waist, and a full skirt trimmed with a velveteen bow. Sweep back her hair with a satin headband adorned with a triple-layered bow, then add opaque black tights and patent purple shoes for the finishing touch. Includes a &apos;? ?Loyal&apos;? rectangle charm. 2. Caroline&apos;? ?s Winter Coat & Cap($32) Caroline loves to play outdoors in frosty winter weather. The coat fits any doll, so feel free to bundle up any doll in this wool coat, featuring a furry white collar, velveteen accents, and bright brass-tone buttons. Add a matching wool cap with a velveteen bow and a wide brim to keep her warm. 3. Holiday Accessories for Dolls($32) Top off your doll&apos;s outfit with this fancy jacket made of the softest velveteen, and features a ruffled neckline and bell sleeves. Give your doll a pretend bracelet watch as the finishing touch, then treat her to a make-believe night at the theater&apos;? ?two Nutcracker Ballet tickets, and a tiny nutcracker toy with a mouth that opens. 4. Julie&apos;? ?s Car Wash Set($350) This 1974 Volkswagen Beetle car is the first in line to be spiffed up. It can seat two 18&apos;? dolls, and features authentic details: a radio that plays five &apos;? ?70s songs, rolling wheels, a hood and trunk that open, a working horn and headlights, seatbelts, a permanently lowered canvas top, and an engine that &apos;? ?runs&apos;? at the push of a button. Your doll can &apos;? ?wash&apos;? the car with a yellow bucket, window washer, bottle of faux soap, and two cloth towels. Includes a &apos;? ?Save the Eagles Car Wash&apos;? sign to display. 5. Winter Chalet($150) This beautiful chalet is the perfect place for your doll to warm up after hitting the slopes. It&apos;? ?s made to look like a rustic log cabin, with an arched roof, faux-wood floors, window shutters that open, and a fireplace that really lights. An illustrated &apos;? ?winter fun&apos;? poster hangs on the wall, and you can add a pretend holly wreath for a festive touch. There&apos;? ?s even a red trestle bench with curvy legs to pull close to the hearth with a mug of faux cocoa! 6. Caroline&apos;? ?s Ice Skating Set($22) These special ice skates were made true to her time, featuring metal blades and red straps to hold them securely over her canvas boots. Caroline pulls on thick knit mittens to keep her hands toasty warm while she plays outdoors. 7. An American Girl: McKenna Shoots for the StarsDVD & Blu-ray $21.95 Nine-year-old McKenna Brooks is on track to make the regional competitive team in gymnastics but off track in school, where she&apos;? ?s struggling to keep up. When McKenna has to get a tutor, she&apos;? ?s embarrassed&apos;? ?and desperate to keep her tutoring a secret. Then she has an accident at the gym, which sidetracks her from gymnastics. Could things get any worse? McKenna needs her friends now more than ever, but the secret she&apos;? ?s keeping is driving a wedge between her and them. Can she find the courage to tell her friends the truth? And will she recover from her injury in time to return to the sport she loves? American Girl products are available through the American Girl catalogue at 1-800-845-0005, at americangirl.com, and at our American Girl retail stores. Momtrends was not paid for this post. We do get some AG gifts and others we buy. We&apos;re hooked.